"The feeling for and love of nature always strike a chord sooner or later with people who take an interest in art. The duty of the painter is to study nature in depth and to use all his intelligence, to put his feelings into his work so that it becomes comprehensible to others. But working with an eye to saleability isn’t exactly the right way in my view, but rather is cheating art lovers. The true artists didn't do that; the sympathy they received sooner or later came because of their sincerity. I know no more than that, and don't believe I need to know any more." 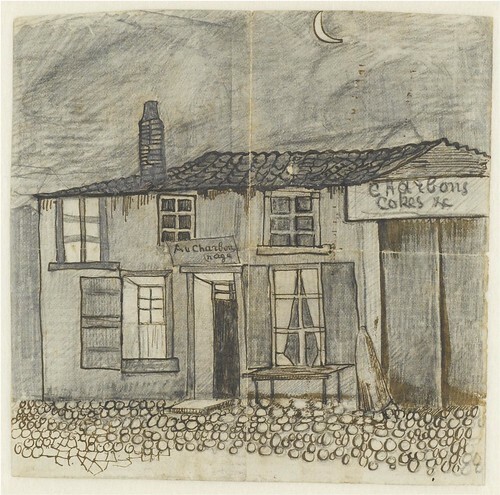 "That little drawing, ‘The Au charbonnage café’ is really nothing special, but the reason I couldn’t help making it is because one sees so many coalmen, and they really are a remarkable people. This little house is not far from Trekweg, it’s actually a simple inn right next to the big workplace where the workers come in their free time to eat their bread and drink a glass of beer. Back during my time in England I applied for a position as an evangelist among the coal-miners, but they brushed my request aside and said I had to be at least 25 years old. You surely know that one of the root or fundamental truths, not only of the gospel but of the entire Bible, is ‘the light that dawns in the darkness’. From darkness to Light. Well then, who will most certainly need it, who will have an ear to hear it?" "Nature always begins by resisting the draughtsman, but he who truly takes it seriously doesn’t let himself be deterred by that resistance, on the contrary, it’s one more stimulus to go on fighting, and at bottom nature and an honest draughtsman see eye to eye. Nature is most certainly ‘intangible’, though, yet one must seize it, and with a firm hand. And now, after spending some time wrestling and struggling with nature, it’s starting to become a bit more yielding and submissive, not that I’m there yet, no one is less inclined to think so than I, but things are beginning to go more smoothly. The struggle with nature sometimes resembles what Shakespeare calls ‘Taming the shrew’ (i.e. to conquer the opposition through perseverance). In many things, but more particularly in drawing, I think that delving deeply into something is better than letting it go. I feel more and more as time goes on that figure drawing in particular is good, that it also works indirectly to the good of landscape drawing. If one draws a pollard willow as though it were a living being, which it actually is, then the surroundings follow more or less naturally, if only one has focused all one’s attention on that one tree and hasn’t rested until there was some life in it." "I’ve also done a bleaching ground at Scheveningen* on the spot in one go, entirely in wash almost without preparation, on a very coarse piece of torchon." 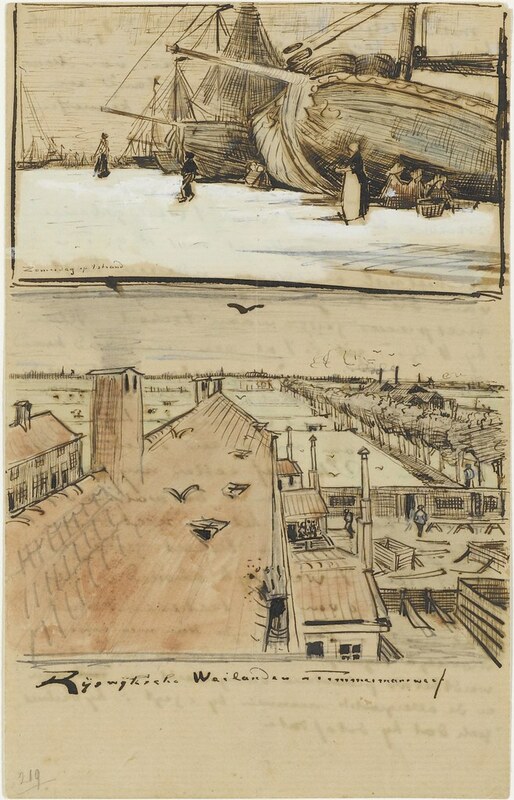 "I now have 3 of Scheveningen — again the Fish-drying barn you know — drawn in as much detail — only now there’s colour as well. As you well know, Theo, it isn't harder to work in colour than in black and white, the opposite perhaps, but as far as I can see 3/4 comes down to the original sketch, and almost the whole watercolour depends on its quality. It isn’t enough to give an approximation, and my aim has been and still is to make it more intense. I believe that's already evident in the black-and-white fish-drying barns, because there you can follow everything and see how it all fits together, and look, I think this is why I now work much more fluently in watercolour, because for such a long time I did my best to draw more correctly." I’ve attacked that old giant of a pollard willow, and I believe it has turned out the best of the watercolours. 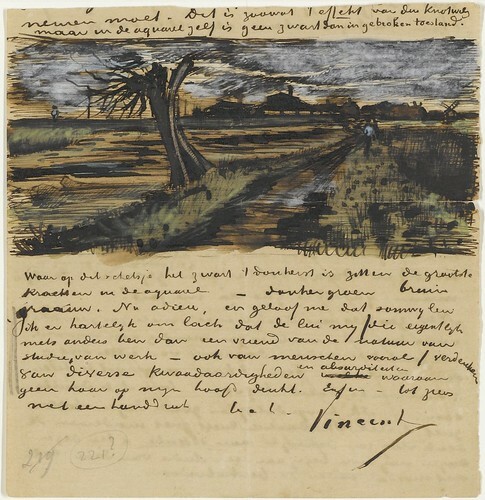 A sombre landscape — that dead tree beside a stagnant pond covered in duckweed, in the distance a Rijnspoor depot where railway lines cross, smoke-blackened buildings — also green meadows, a cinder road and a sky in which the clouds are racing, grey with an occasional gleaming white edge, and a depth of blue where the clouds tear apart for a moment. There’s so much paint around that it has even got onto this letter — I’m working on the big watercolour of the bench. I hope it comes off, but the great problem is to retain detail with deep tone, and clarity is extremely difficult. 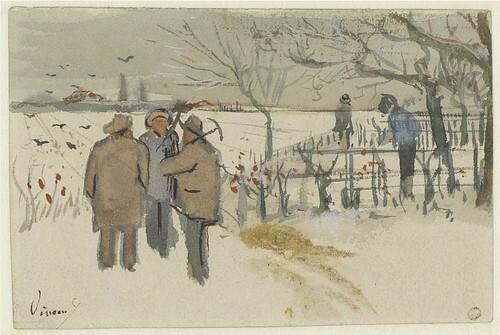 Adieu again, a handshake in thought, and believe me, Ever yours, Vincent"
"How beautiful it is outdoors — I’m doing my best to capture autumnal effects. I’m writing to you in great haste, I assure you that there’s a lot involved in compositions with figures, and I’m very busy. It’s like weaving: you have to give it all your attention to keep the threads apart; you must control and keep an eye on several things at once." "Imagine, this week to my great surprise I received a package from home — with a winter coat, warm trousers, and a warm lady’s coat. I was very touched. The churchyard with the wooden crosses is often on my mind, so I may do some studies for it in advance – I would like to do something like that in the snow – a peasant funeral or the like. In short, an effect like the enclosed scratch of miners." "Do you remember bringing me pieces of natural chalk last summer? I tried to work with it then but couldn’t. So I was left with a few pieces that I took up again these past few days; enclosed a scratch done with it. As you see, it’s a warm, unusual black. I’d very much like you to bring some more, this summer say. It has one great advantage — the firm pieces are much easier to hold while sketching than a thin stick of conté*, which has nothing to grip and breaks all the time. So it’s marvellous for sketching out of doors." "Enclosed is a scratch out of the window. I always find it wonderfully cosy to sit by a fire in the dusk and to look through the window at a snow-covered landscape. I’ve also found that natural chalk here in town. It’s an article that was practically unknown to me until now. Now, though, I find it isn’t that rare — and you probably know it and already have it. If not, I think it a singular medium in which to draw. Adieu, old chap, a handshake in thought." "Here’s a scratch, for example, that I did in that kind of daydream. It shows a gentleman who has had to spend the night at a village inn due to the late arrival of diligence or some such reason. Now he has risen early, and while he orders a glass of brandy for the cold he pays the innkeeper’s wife (a woman with a peasant’s cap). But it’s still very early in the morning, ‘the crack of dawn’, — he must catch the mail-coach — the moon is still shining and the glistening snow can be seen through the window of the taproom — and the objects cast oddly whimsical shadows. In short, the whole of nature is an inexpressibly beautiful Black and White exhibition when there are those snow effects." 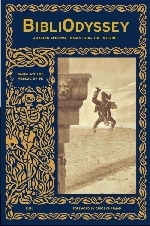 "Do you remember that in the very beginning I once sent you sketches of a sort, ‘Winter Tale’, Shadows passing, etc.? You said at the time that you thought the action of the figures was insufficiently expressed — do you remember? Now that was entirely true, but for a few years now I’ve been toiling solely on the figure in order to get some action and also some structure into it. And precisely because of that toil, I had rather lost my enthusiasm for composing and for making my imagination work once more. It was reawakened when Rappard talked about those early days with a certain warmth. Now, however superficial this little sketch may be, I believe you’ll find something of the earliest time in it, but just with more action. 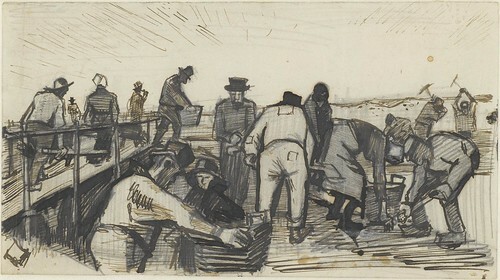 This is Peat diggers in the dunes — the drawing itself is now about 1 metre by 1/2 metre. It’s a wonderfully beautiful sight in nature, from which an infinite number of subjects can be taken. I went there often these last few weeks and have all kinds of studies of it. Rappard saw studies of it, but when he was here we didn’t know how to bring it together. This composition came about later. And once I’d finally got it all just about together, it went quite smoothly, and at 4 o’clock in the morning I was already working on it in the attic." "Things are going quite well for me here in Brabant, anyway I find the countryside here very stimulating. Now, in these last few weeks I have made 4 watercolours of Weavers. And a few others of a timber sale, an interior with a seamstress, and a gardener, all watercolours. Herewith a few scratches of them." 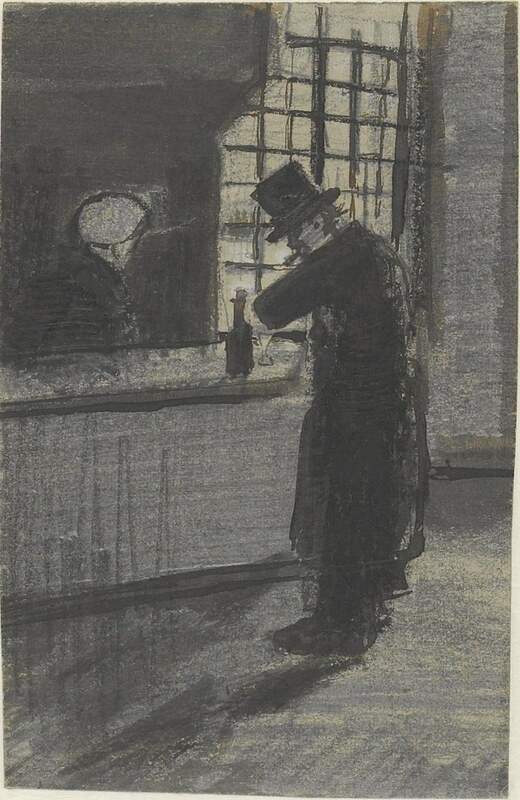 You mustn’t, whatever you do, think that I have great expectations regarding the appreciation of my work — I believe one must be satisfied if one gets to the point where one can persuade a few people of the soundness of what one is striving for and is understood by them, without exaggerated praise. And the rest is a matter of, if something comes of it so much the better, but something that one should even think about as little as possible. But still I believe the work has to be seen, precisely because the few friends can settle out from the stream of passers-by. One doesn’t have to be guided by what the majority say or do, though." "I follow no system of brushwork at all; I hit the canvas with irregular strokes which I leave as they are, impastos, uncovered spots of canvas — corners here and there left inevitably unfinished — reworkings, roughnesses; well, I’m inclined to think that the result is sufficiently worrying and annoying not to please people with preconceived ideas about technique. 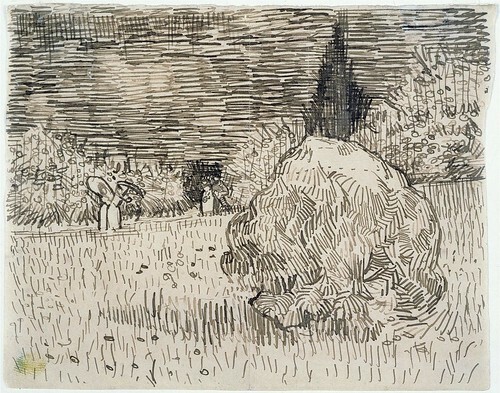 Here’s a croquis, by the way, the entrance to a Provençal orchard with its yellow reed fences, with its shelter (against the mistral), black cypresses, with its typical vegetables of various greens, yellow lettuces, onions and garlic and emerald leeks. While always working directly on the spot, I try to capture the essence in the drawing — then I fill the spaces demarcated by the outlines (expressed or not) but felt in every case, likewise with simplified tints, in the sense that everything that will be earth will share the same purplish tint, that the whole sky will have a blue tonality, that the greenery will either be blue greens or yellow greens, deliberately exaggerating the yellow or blue values in that case. Anyway, my dear pal, no trompe l’oeil in any case." "And we sometimes lack the desire to throw ourselves head first into art again and to build ourselves up for that. We know we’re cab-horses and that it’ll be the same cab we’re going to be harnessed to again. And so we don’t feel like doing it and we’d prefer to live in a meadow with a sun, a river, the company of other horses who are also free, and the act of generation. And perhaps in the final account your heart condition comes partly from there; it wouldn’t greatly surprise me. We no longer rebel against things, we’re not resigned either — we’re ill and it’s not going to get any better — and we can’t do anything specific about it. I don’t know who called this condition being struck by death and immortality. The cab we drag along must be of use to people we don’t know. But you see, if we believe in the new art, in the artists of the future, our presentiment doesn’t deceive us. When good père Corot said a few days before he died: 'last night I saw in my dreams landscapes with entirely pink skies', well, didn’t they come, those pink skies, and yellow and green into the bargain, in Impressionist landscapes? All this is to say there are things one senses in the future and that really come about." "I’m well aware that I wrote to you only yesterday, but the day has been so beautiful again. My great sorrow is that you can’t see what I see here. From 7 o’clock in the morning I sat in front of what was, after all, nothing special — a round cedar or cypress bush — planted in grass. You know this round bush already, since you already have a study of the garden. By the way, included herewith a croquis of my canvas — a square no. 30 again. "But isn’t it true that this garden has a funny sort of style that means that you can very well imagine the Renaissance poets, Dante, Petrarch, Boccaccio, strolling among these bushes on the flowery grass?" 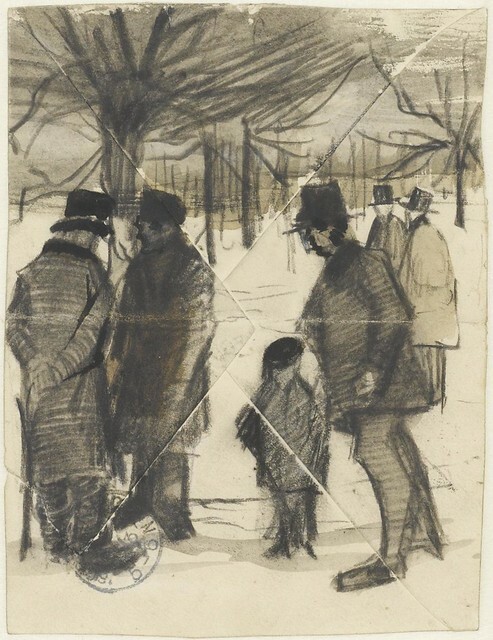 "..croquis of a square no. 30 canvas showing the house and its surroundings under a sulphur sun, under a pure cobalt sky. That’s a really difficult subject! But I want to conquer it for that very reason. Because it’s tremendous, these yellow houses in the sunlight and then the incomparable freshness of the blue. All the ground’s yellow, too. I’ll send you another, better drawing of it than this croquis from memory; the house to the left is pink, with green shutters; the one that’s shaded by a tree, that’s the restaurant where I go to eat supper every day. My friend the postman lives at the bottom of the street on the left, between the two railway bridges." "Included herewith little croquis of a square no. 30 canvas — the starry sky at last, actually painted at night, under a gas-lamp. The sky is green-blue, the water is royal blue, the fields are mauve. The town is blue and violet. The gaslight is yellow, and its reflections are red gold and go right down to green bronze. Against the green-blue field of the sky the Great Bear has a green and pink sparkle whose discreet paleness contrasts with the harsh gold of the gaslight. 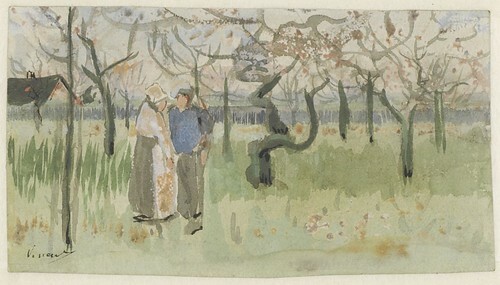 Two small coloured figures of lovers in the foreground." 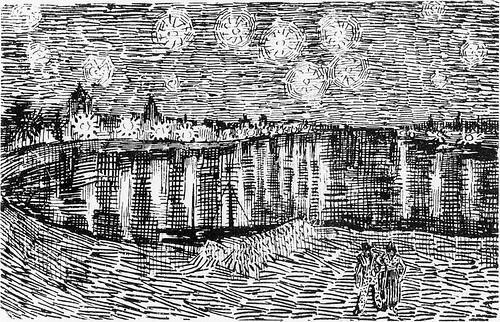 "[A] study of the Rhône, of the town under gaslight and reflected in the blue river. With the starry sky above — with the Great Bear — with a pink and green sparkle on the cobalt blue field of the night sky, while the light of the town and its harsh reflections are of a red gold and a green tinged with bronze. Painted at night." 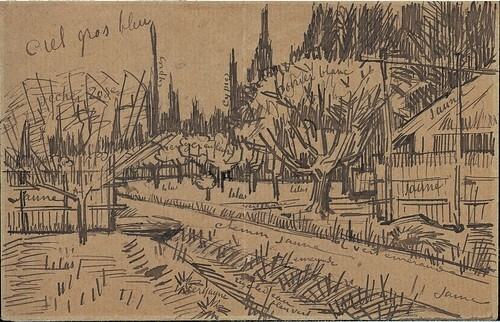 "At last I’m sending you a little croquis to give you at least an idea of the direction the work is taking. Because today I’ve gone back to it. My eyes are still tired, but anyway I had a new idea in mind, and here’s the croquis of it. No. 30 canvas once again. This time it’s simply my bedroom, but the colour has to do the job here, and through its being simplified by giving a grander style to things, to be suggestive here of rest or of sleep in general. In short, looking at the painting should rest the mind, or rather, the imagination. I’ll work on it again all day tomorrow, but you can see how simple the idea is. The shadows and cast shadows are removed; it’s coloured in flat, plain tints like Japanese prints." "Look here, I wrote to you the other day that my vision was strangely tired. Well, I rested for two and a half days, and then I got back to work. But not yet daring to go outside, I did, for my decoration once again, a no. 30 canvas of my bedroom with the whitewood furniture that you know. Ah, well, it amused me enormously doing this bare interior. With a simplicity à la Seurat. 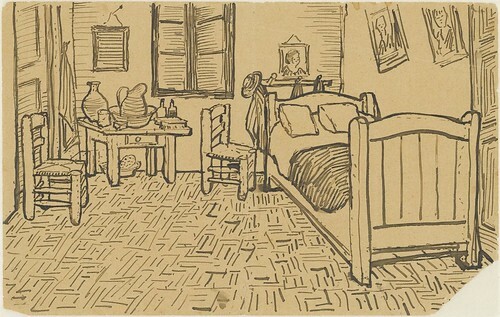 In flat tints, but coarsely brushed in full impasto, the walls pale lilac, the floor in a broken and faded red, the chairs and the bed chrome yellow, the pillows and the sheet very pale lemon green, the bedspread blood-red, the dressing-table orange, the washbasin blue, the window green. I had wished to express utter repose with all these very different tones, you see, among which the only white is the little note given by the mirror with a black frame (to cram in the fourth pair of complementaries as well). Anyway, you’ll see it with the others, and we’ll talk about it. Because I often don’t know what I’m doing, working almost like a sleepwalker." "Foreground of green and pink grass, on the left a green and lilac bush and a stem of plants with whitish foliage. In the middle a bed of roses. To the right a hurdle, a wall, and above the wall a hazel tree with violet foliage. Then a hedge of lilac, a row of rounded yellow lime trees. The house itself in the background, pink with a roof of bluish tiles. 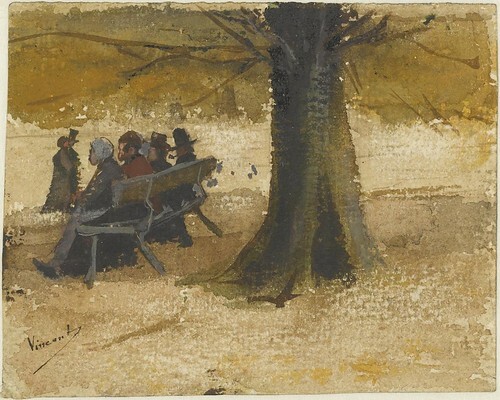 A bench and 3 chairs, a dark figure with a yellow hat, and in the foreground a black cat. Sky pale green." "As for myself, I’m applying myself to my canvases with all my attention, I’m trying to do as well as certain painters whom I’ve liked and admired a great deal. What seems to me on my return – is that the painters themselves are increasingly at bay. Very well. But has the moment to make them understand the utility of a union not rather passed already? On the other hand a union, if it were formed, would go under if the rest went under. Then you’d perhaps tell me that dealers would unite for the Impressionists; that would be very fleeting. Anyway it seems to me that personal initiative remains ineffective, and having done the experiment, would one begin it again?" 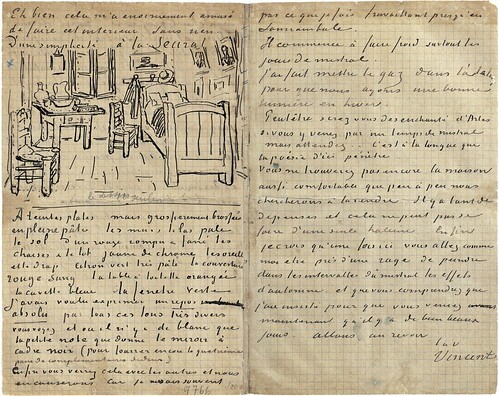 "This magnificent new edition of the complete Van Gogh letters is a celebration not only of a great artist but of art itself. Through six large volumes of more than 900 letters, meticulously annotated and accompanied by a wealth of illustrations, we are allowed to follow the painter's progress through a long and at times painful apprenticeship to ultimate artistic triumph. 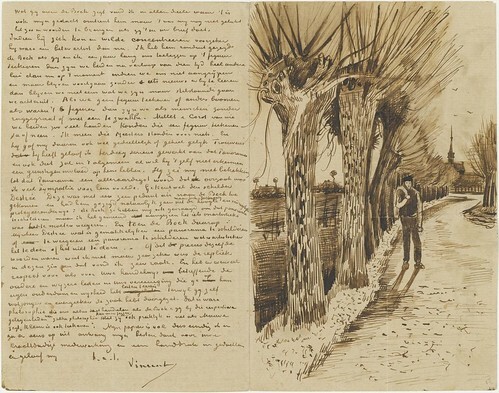 In these volumes, the arc of Van Gogh's life as traced in the letters is supported on a complex sub-structure of pictorial examples – every single work mentioned in the correspondence, from the merest sketch to finished masterpieces, is identified and reproduced – and the result is a deeply affecting insight into the mind of one of the strangest and yet best-loved painters of the early Modernist period." 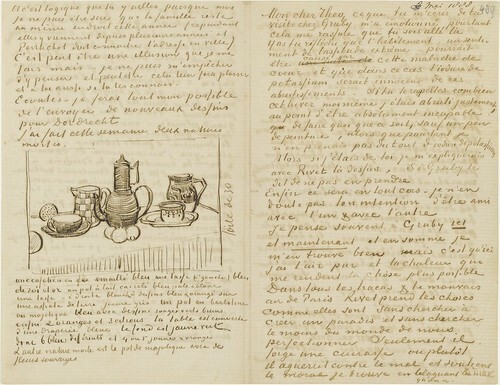 'Vincent van Gogh: The Letters: The Complete Illustrated and Annotated Edition' (2009). 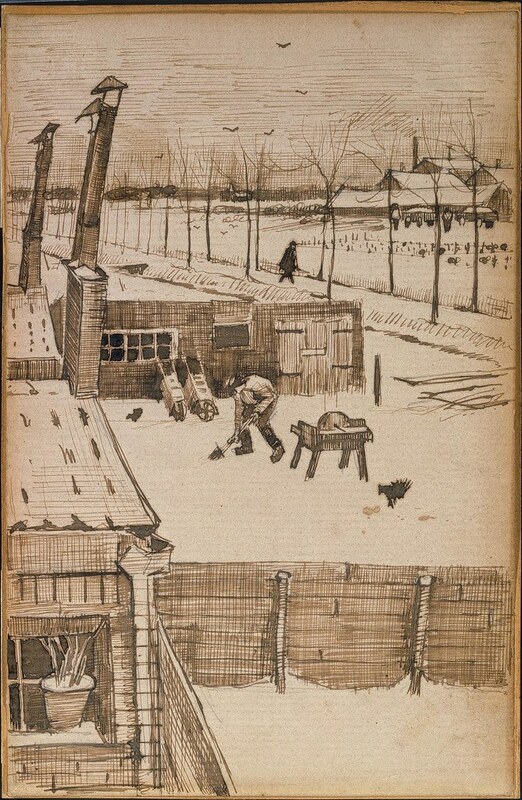 Recommended: Charley Parker at Lines and Colors on Van Gogh's Letters. Wonderful work, here. Thanks so much for sharing it! 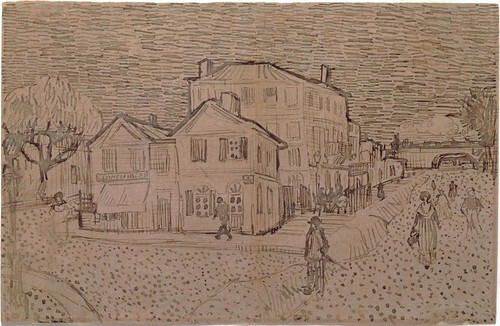 Funny, I searched your blog for any posts pertaining to Van Gogh earlier this afternoon - and here you go! I'm only beginning to discover how great this blog is and the potential for inspiration. Thank you! I've never seen it in such good quality before. I put your blog in my Google Reader list because of a math art related post you did a month or two ago. Mostly I skim through your posts, thinking "that is so cool", but not taking any time with them. 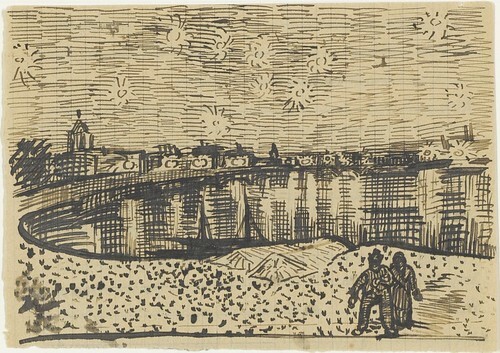 I love Van Gogh's work, and will enjoy coming back to this. Just this weekend my husband and I were trying to interest our nine year old in Van Gogh and viola! Thank you so much for your fabulous site. This is the most interesting collection of Van Gogh I've ever scene. 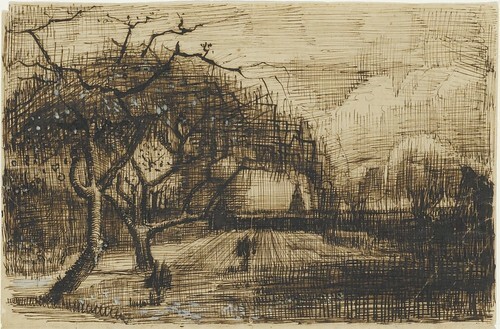 I live in Washington, D.C., and the National Gallery of Art has several Van Gogh works in their permanent collection, a few of which are on display. I visit them often, but honestly, I wish they'd show more of his sketches. You know, I don't know how an exhibition of these letter sketches would go. I mean, it would be nice to see them in reality of course, but they would be on total security lock-down and they're only what?, 3"x6" pieces of paper or thereabouts. I actually think the digital versions, where you can look at them in fairly high res and linger over them at your leisure, is probably the better option for this sort of material. 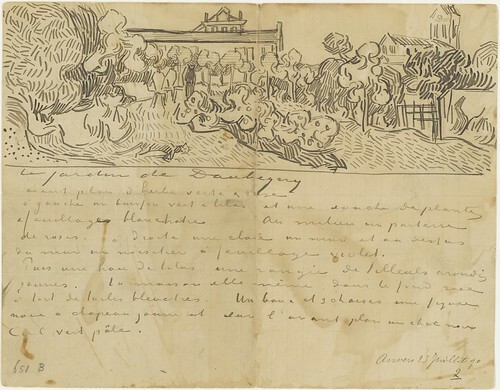 Or perhaps looking at them in the volumes that make up the Van Gogh Letters website. Strangely, despite the plethora of info and notes and bibliographic details and whatnot on the site, I couldn't find a list of repositories that actually own the letters. They are written down in each letter's entry but I wondered how scattered they all are. 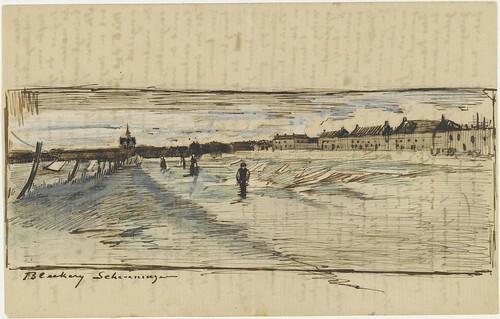 I know the Van Gogh museum has the most and I remember seeing the Morgan Musuem a few times. I presume there would be many other owner-repositories. I suspect just getting an exhibition together would be really really H.A.R.D. Indeed, an exhibition would probably be incredibly difficult to put together, but I think it is definitely possible considering his popularity and importance. 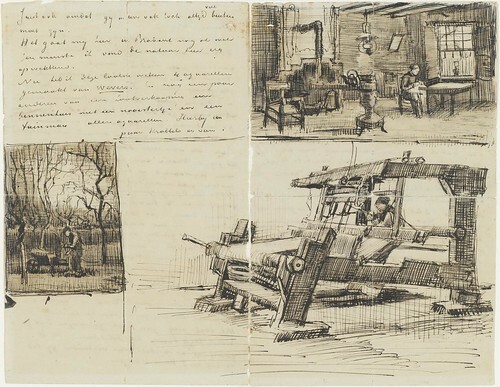 An artist's sketches and writings reveal some of the deepest intricacies of their work. I guess the size and delicacy of it all could make the display of this work difficult, but I feel it is important to show these things, whether it be in a gallery setting or on a blog, to help educate those who wish to further understand an artist's body of work. I just wanted to say hello and to express my total admiration for your blog! I know that I will be here again, however will I get any work done with such a distraction? Absolutely fascinating. I read the illustrated letters in my teens and these samples brought back so strong a sense of my obsession with the impressionists and fellow travelers way back when. Thank you for this. 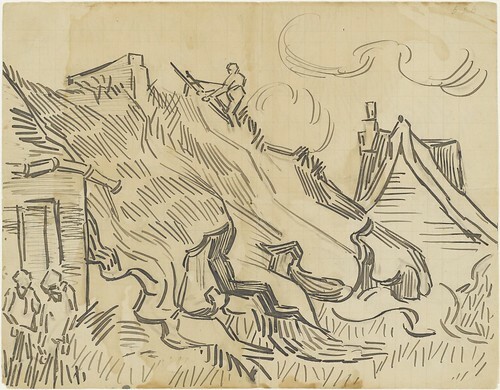 I am not so much a fan of Van Gogh's paintings, but I have a small obsession with his drawings, and these fantastic hi-res versions are like ten birthdays in a row! Thank you so much for sharing, PK. Oh boy, thank you so much for this fabulous post. The work is just wonderful and reading the accompanying letters is really a treat. Just great stuff as always. Wundervoll! Ich danke sehr für diesen phantastischen Einblick! / Wonderfull! Thanks a lot for this fantastic pieces of work and live!